Texas was the first state in the South with a majority-minority population, and for a decade now it has been the only one. But in 2025, another Southern state is expected to hit that milestone: Georgia. That's according to projections published in a recent report called "States of Change," a collaborative effort by the Center for American Progress, the Brookings Institution and the American Enterprise Institute which looks at how demographic change is affecting the American electorate. The report identifies 10 trends that touch on racial and ethnic demographics, generational change, changes among young and working class whites and the rise of unmarried voters. One major theme in the report is the dramatic growth of racial and ethnic minorities in the United States. Currently, there are three states besides Texas that are majority-minority: Hawaii, New Mexico and California. 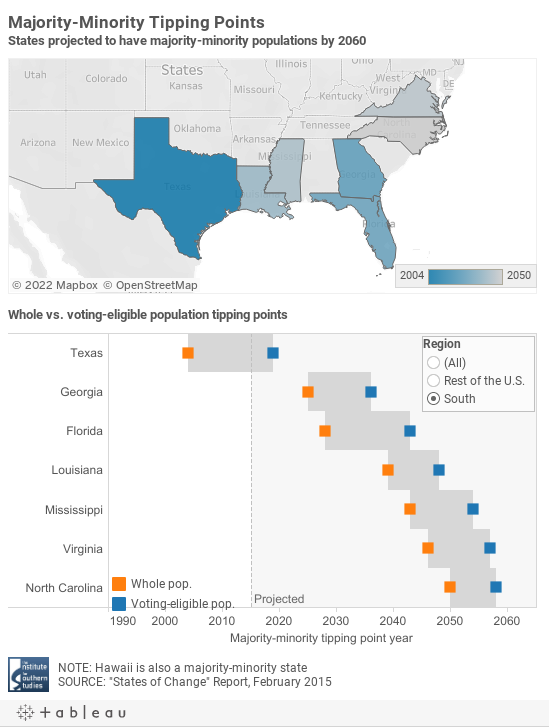 The report projects the number of majority-minority states will rise to 22 by 2060, with states' voting-eligible populations hitting that mark several years later. Seven Southern states and their voting-eligible populations are expected to become majority-minority over the next 45 years. They include political battlegrounds like Georgia, Florida, North Carolina and Virginia where political observers have been speculating whether minority voters will make the difference in close races. But Southern states like Louisiana and Mississippi that get less attention but have large minority populations also make the list. The report notes that minority voters don't necessarily all vote the same way and that those voting preferences are subject to change in the coming 20 to 40 years. "Any assumption that majority-minority states will adopt a unified policy or political orientation would be unwise," the authors write. But in the coming years it will be critical to ensure that this growing minority segment of the electorate, which has traditionally had lower registration and voting rates and which has historically faced barriers to exercising voting rights, can access the ballot and make their voices heard. See the full report here and check out its interactive graphic for a state-by-state look at demographic changes.